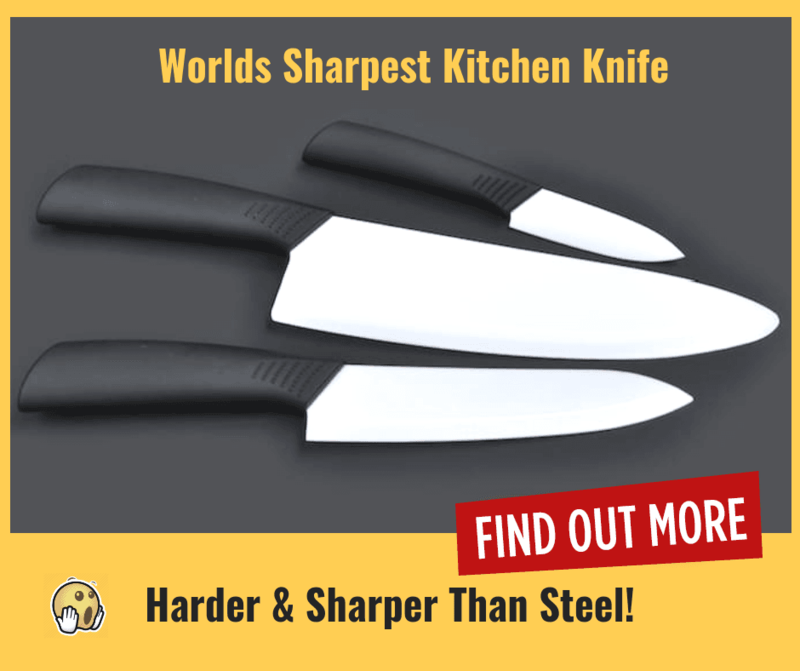 The popularity of this ultra-sharp professional ceramic kitchen knife has grown rapidly ever since it was featured in various cooking videos and word of mouth got around and now everyone is talking about the amazing sharpness and durability of this cool knife. The Home Of The Wolds Sharpest Kitchen Knife. ...or keep reading for my review, pros and cons, interesting facts, comparisons to other blades and more. Why Did I Buy This Knife? How Strong Is This Knife? What Is So Great About This Ceramic Knife? The main reason why I decided to buy this knife at first was just curiosity, as I wanted to see what was all the fuss about and I was also curious to see if the claims were true. 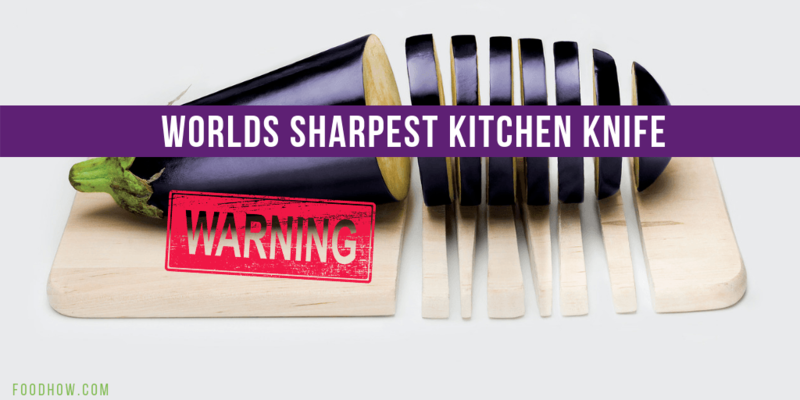 Is it really the sharpest kitchen knife in the world? Not only that, I did actually need a new blade. My old chef’s knife wasn’t performing all that well anymore and it had few chips and although it was stainless steel it had developed a bit of rust around the edges. As I am using my knife daily for cooking I thought I should get something that CAN really do the job and will last for a long time. This knife is very modern looking and it has a very beautiful design but that was not the main thing at all I was looking in a good kitchen knife. What I wanted was more durability and firmness than your average stainless-steel knives would provide and most importantly, I wanted something that is resistant to acids, rust, and corrosion. I was really happy with the fact that this knife was made out of ceramic as that ensured me this knife won’t deteriorate any time soon. So, if you are also looking to purchase a high-quality tool to add to your kitchen, or perhaps you are not that familiar with the ceramic blades then you’ll want to keep on reading so you can learn from my research and experience and hopefully, it will help you to make a more informed decision. In this post, I will not only cover the P600 ultra-sharp kitchen knife but I will also examine the general features of ceramic blades so that you will understand them better. This will make it easier for you to compare the various materials of these different knife sets and figure out what makes one superior to another. As the name would suggest, this knife is made from ceramic material. The more scientific name is zirconium dioxide or zirconia for short. This is a highly durable material which can make a super tough and long-lasting blade. The production of ceramic knives begins with putting zirconia powder through a dry press and then applying fire to the pressed powder. This causes the blade of the knife to form. From there, a special grinding wheel is used to grind the blade’s edges. This is what sharpens the blade to produce the actual cutting ability of the knife. Watch this Amazing Discovery Channel video below about how these ultra-sharp ceramic blades are made and how they achieve this superior durability and firmness to make it almost as strong as diamond. Just to give you an understanding of how hard P600 Ceramic Blade is in comparison to some of the other well-known materials lets look at the Mohs scale of 1-10 mineral hardness. On the Mohs scale talc is listed on the bottom at number 1 and a fingernail is listed number 2. A normal metal knife blade is listed 5 and Zirconia is listed 8.5 which is just below the diamond that tops our list at number 10. Here is an interesting fact. Diamonds are no longer the hardest material in nature. Wurtzite Boron Nitride and Lonsdaleite are two known materials which are harder than diamonds. Whenever graphite-based meteorites crash through the planet, it forms lonsdaleite. When a volcanic eruption occurs, wurtzite boron nitride is left behind. I will let you know as soon as someone starts making knives out of these materials. Although I was a bit sceptical at first before I bought this knife, I must say it really did win me over straight away once I unpacked it and started slicing stuff. It was the sharpness and how comfortable and light it felt in my hand. Also, what I have learned from talking to people and reading other peoples reviews, it turns out that people love P600 for a variety of different reasons. The main reason, however, is that this cutter is ultra-sharp and has far superior durability and hardness in comparison to metal knives. Once I open the box and started chopping my scepticism was gone, this was undoubtedly the sharpest knife I had ever used. Another reason why people love this knife is, its both rust resistance and stain resistance. The sharpness of its edges will remain sharp for so much longer than the edges of metal knives. The great thing is that you’ll hardly need to sharpen your P600 blade. Of course, the cutting edge of the blade does eventually deteriorate and lose its sharpness. But this won’t happen for a very long while. However, once it does happen, a special sharpening service or a diamond sharpener is needed because normal sharpeners won’t work on this super hard ceramic blade. P600 professional chef's knife is perfect for cutting thin slices of your favourite meats, bread, vegetables, and fruits. I think that any kitchen where some serious cooking takes place should definitely include this amazing tool to its arsenal. It does not need to be either/or, I would recommend having a good set of stainless steel knives also for the job that requires more rough cutting. This video will play on ShefsFoundry website. Also, what I like about this knife is that it is lightweight, odour-free, and easy to clean. The same cannot be said for my old steel knife. I think I have pretty well covered all the pros and why I like the P600 and now you should be aware of some the disadvantages as well. You need to treat this knife carefully because it can easily break or chip if it experiences a tough blow or impact. 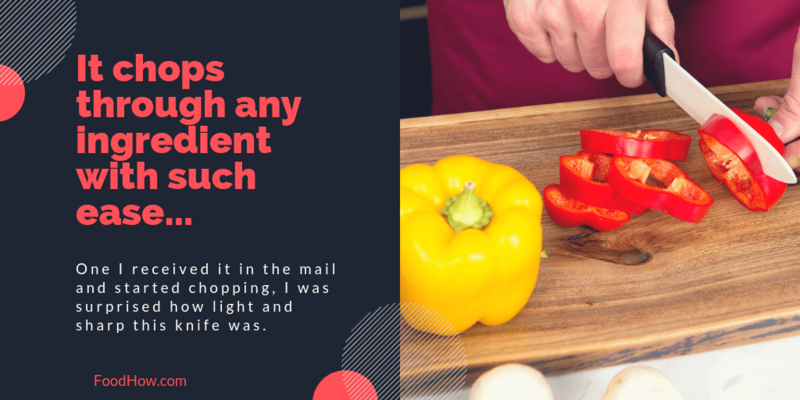 For instance, if you drop it onto a hardwood floor or cut up vegetables on a very firm hard surface, this could damage the blade over time. Do not chop anything that is hard either, such as frozen meat or bones. Also, never use it to try and pry off the lid of some container. If you do, the tip of the blade might break off. This might all sound bad, but take a look at the disadvantages of steel knives. For one thing, there are more pores in steel than in ceramic. That is why steel tends to trap odour and stains from various food particles it encounters. In addition, the chemical reactive nature of steel is what causes it to rust. Due to the heavy weight of steel knives, it can be tiring to chop food for extended periods of time. A lot of people get annoyed with steel knives because they must be sharpened regularly while ceramic knives do not. As you can see, each type of knife has their ups and downs. The final decision you make will be based on your own personal needs, desires, and preferences. The way you need to cut your food will also play a factor in your decision. Many chefs love to select their own cookware and the material of their knives, whether it’s stainless steel or ceramic. I personally think that any good kitchen should have a set of both of knives, stainless steel and also ceramic. Most people will clean their ceramic knives by just putting them in the dishwasher. Even though this might seem like a good solution for cleaning your kitchen tools, I would personally not recommend it for two important reasons. Extremely hot water and violent motion of the dishwasher against the hard plates could damage the blades. The first reason has to do with hot water. When you clean anything in a dishwasher, it is going to be exposed to very hot water temperatures. This kind of hot water will ruin the edge of any ceramic blade. These edges are serrated and have very thin metal strips on them. As long as those edges stay exposed to cool or normal room temperatures, then they will remain sharp and intact. But if they incur heat exposure, the edge of the blade will start to dull out because heat causes the little teeth along the edge to curl up. 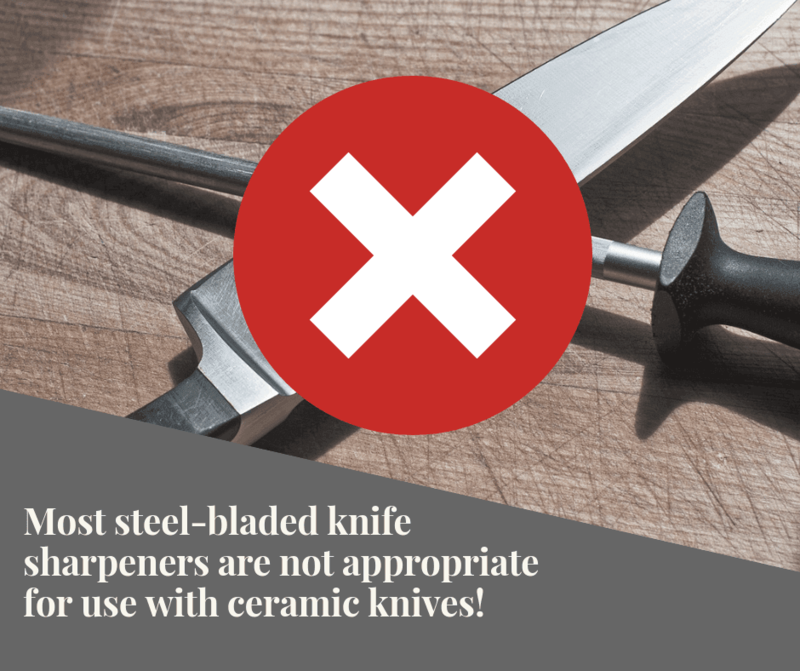 For this reason, only use cold or lukewarm water for cleaning your ceramic blades. Secondly, there is a lot of water pressure inside of a dishwasher which aggressively cycles the water through all the knives and dishes. If the edge of a ceramic knife were to take a direct hit and bang against another dish or a utensil, then it would cause the sharp edge to chip away. You actually won’t need to care for this knife as much as regular metal knives. As with my old steel bladed knife, I had to sharpen it on a regular basis to sustain its cutting power. This amazing cutter, on the other hand, can retain its sharpness for a much longer time (about ten times longer). Besides, the ceramic blade is so hard that you cannot sharpen it with a normal knife sharpener. These regular consumer knife sharpeners are meant for steel-bladed knives only. Using a regular sharpener won't work because the only material hard enough to sharpen ceramic is diamond. With P600 ceramic blade, it takes a lot longer for its cutting edges to diminish. That is why you don’t need to sharpen it as frequently. I have been using mine constantly for about 3 months now and I have not seen any decline in its sharpness yet. However, you will need to sharpen it at some point. When this time comes, it will require the use of a special sharpening service or a special sharpening tool. There are a lot of benefits to using ceramic knives instead of steel knives. The main difference is the material the blade is made out of. The ceramic blade is lighter, sharper and the razor sharp edge won't wear out. The hardness rating of the P600 ceramic knife is almost parallel to the hardness rating of diamonds. Because of this, the cutting edges of this knife will last so much longer without needing to be sharpened regularly. In fact, the edge won’t even need to be straightened either. When the time comes for your P600 ceramic knife to be sharpened, it needs to be done by a special sharpener. As with your steel knives, depending on the usage, you'll probably need to sharpen them once a week. The blades of ceramic knives will not retain any nasty food smells or stains after cutting food with them because they are not porous. A ceramic knife can be cleaned by merely rinsing it off in the sink. 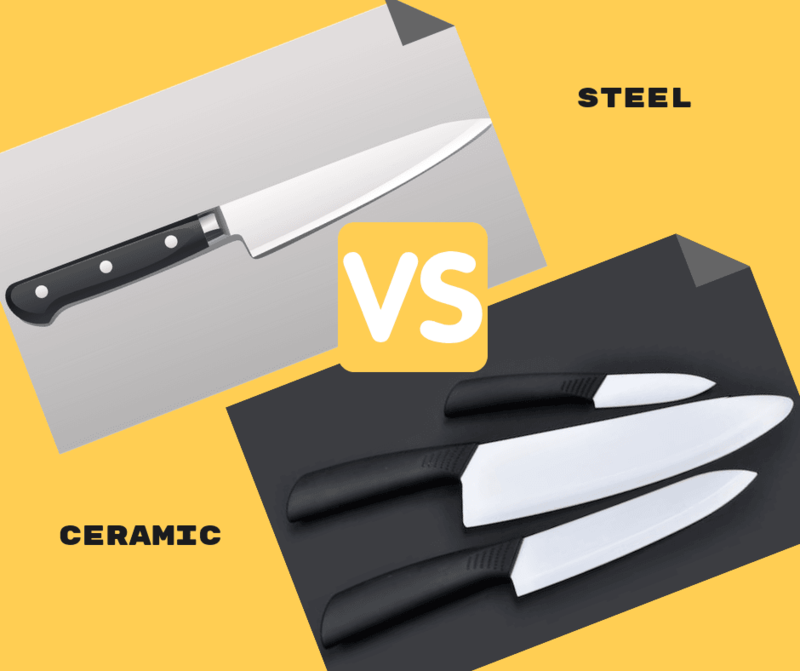 Ceramic material is so much lighter than steel, making ceramic knives lighter weight in comparison to steel knives. As a result, you won’t need much effort to slice and chop your food. Since there are fewer pores in ceramic material, there is a less chance of bacteria and germs being retained on the knife. This also makes it easier to clean the ceramic knife too. The ceramic material can be described as “non-reactive.” This means it does not rust as metal does. With all these advantages of ceramic knives, there are a few setbacks as I mention above. So let's go over these again. For instance, it is not a good idea to cut or slice harder food items with ceramic knives. This would include bones, frozen meat, and anything else hard. If you attempt to cut hard things like this, the blade will likely chip. 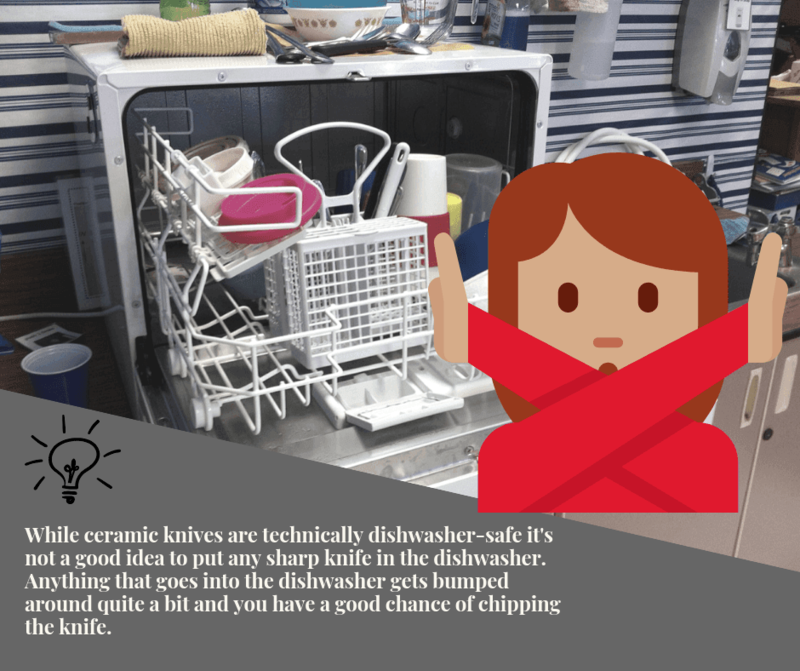 In addition, there is always the chance of you dropping the ceramic knife onto a hard surface or floor, resulting in the edge or tip getting damaged. The functionality and the way in which you use the ceramic knife are huge factors of which knife sets you choose but It would be a good idea to have a set of steel knives also. You can still use your P600 as your main tool and only use your steel knife when needed. Shun knives originate from Japan. They are world renowned knives that are known for their fascinating sharpness and handmade design. Some of the most skilled knife makers in the world make these knives. Each knife must go through a minimum of 100 different steps by hand before it is finished. Shun knives are higher quality stainless steel knives than what you find in the west. Most of us are accustomed to stainless steel knives that are heavy with a thick blade and have soft steel material. This design forces you to put more muscle and work into cutting your food. Plus, you will need to perform more maintenance on the blade because the steel material will dull out quicker. As for the steel knives from Japan, they are thinner, lighter, and harder. This hard steel is an asset when you consider how the blade is sharp and thin. This means you can easily cut food without exhausting yourself at all. If you want to invest in one of these then it would make a good addition to your ceramic knife. Titanium might be good for a lot of things, but not for a knife material. Titanium is a softer and flimsier metal which is difficult to keep sharp. Ceramic is a much better alternative because it is very sharp in comparison. The biggest advantages of titanium knives are that they’re corrosion resistant and lightweight. Some people choose titanium knives for their kitchen because of this. If you don’t care about sharpness so much, then titanium might be a good choice for you. They also have a money back guarantee so so you don't have to worry if you don't like the set for some reason. Also, on their website, you can watch the demonstration video where you can see how easily this knife cuts and slices through various food, it's really cool to watch. When I bought my knife they had a great offer going so I also received a free paring knife and utility knife with my order that I was really happy about. However, if the offer is not available any more this knife would be still a good investment as it will stay sharp for years. Oooo, I’m so glad that you decided to review this knife. I’m a total foodie, and I’ve been curious about these, but haven’t bought one yet, because I’ve heard that they chip. But I hadn’t thought about them being resistant to rust and smell, and now I’m definitely considering! I didn’t see any price comparisons here though – I’d love to see that info here!